In Asia, particularly China, India, Korea and Japan, there is a long history of cooking with cast iron vessels. However, the first mention of a cast-iron kettle in English appeared in 679 or 680, though this wasn't the first use of metal vessels for cooking. The term pot came into use in 1180. Both terms referred to a vessel capable of withstanding the direct heat of a fire. Cast-iron cauldrons and cooking pots were valued as kitchen items for their durability and their ability to retain heat evenly, thus improving the quality of cooked meals. In both Europe and the United States, before the introduction of the kitchen stove in the middle of the 19th century, meals were cooked in the hearth or fireplace, and cooking pots and pans were either designed for use in the hearth, or to be suspended in a fireplace. Cast-iron pots were made with handles to allow them to be hung over a fire, or with legs so that they could stand in the coals. 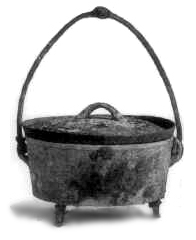 In addition to Dutch ovens with three or four feet, which Abraham Darby I secured a patent in 1708 to produce, a commonly used cast-iron cooking pan called a spider had a handle and three legs allowing it to stand upright over campfires as well as in the coals and ashes of a fireplace. Cooking pots and pans with legless, flat bottoms came into use when cooking stoves became popular; this period of the late 19th century saw the introduction of the flat cast-iron skillet. Cast-iron cookware was especially popular among homemakers during the first half of the 20th century. It was a cheap, yet durable cookware. Most American households had at least one cast-iron cooking pan, and brands such as Griswold, which began manufacturing in 1865, Wagner Ware, which began manufacturing in 1881, and Lodge Manufacturing, which entered the marketplace in 1896 as Blacklock Foundry, all competed for market share. The 20th century also saw the introduction and popularization of enamel-coated cast-iron cookware. Cast iron fell out of favor in the 1960s and 1970s, as teflon-coated aluminum non-stick cookware was introduced and quickly became the item of choice in many kitchens. The decline in daily use of cast-iron cookware contributed to the closure of nearly all the iron cookware manufacturers in the United States. Many went out of business in the 1920s as seen in the List of cast-iron cookware manufacturers. Others were absorbed by other cookware manufacturers, such as the buyout of Griswold by Textron in 1957, who had also purchased the Wagner cast iron manufacturing company. Textron then sold its cast iron division to Randall Corporation in 1959; in 1969 Textron then sold it to General Housewares Corporation (GHC). GHC manufactured cast iron under the Wagner name until the foundry closed in 1999. By the end of the 20th century, Lodge Manufacturing was the only remaining manufacturer of cast-iron cookware in the United States. Today, of the large selection of cookware that can be purchased from kitchen suppliers, cast iron comprises only a small fraction. However, the durability and reliability of cast iron as a cooking tool has ensured its survival. Lodge, Wagner and Griswold cast-iron pots and pans from the 19th and 20th century continue to see daily use to the present day. They are also highly sought after by antique collectors and dealers. However, cast iron has seen a resurgence of its popularity in specialty markets. Through cooking shows, celebrity chefs have brought renewed attention to traditional cooking methods, especially the use of cast iron. In the 2010s, small startup companies such as FINEX, Element Cookware, Smithey Ironware Company, Marquette Castings, Stargazer Cast Iron and Borough Furnace began producing cast-iron cookware designs for specialty cooking markets. The Lodge Manufacturing company is currently the only major manufacturer of cast-iron cookware in the United States, as most other cookware suppliers use pots and pans made in Asia or Europe. Cast iron's ability to withstand and maintain very high cooking temperatures makes it a common choice for searing or frying, and its excellent heat retention makes it a good option for long-cooking strong-flavored stews or braised dishes. Because cast-iron skillets can develop a "non-stick" surface when cared for properly, they are excellent for frying potatoes or preparing stir-fries. Some cooks consider cast iron a good choice for egg dishes, while others feel the iron adds an off-flavor to eggs. Other uses of cast-iron pans include baking, for instance for making cornbread, cobblers and cakes. Most bare cast-iron pots and pans are cast as a single piece of metal, including the handle. This allows them to be used on both the stovetop and in the oven. Many recipes call for the use of a cast-iron skillet or pot, especially so that the dish can be initially seared or fried on the stovetop then transferred into the oven, pan and all, to finish baking. Likewise, cast-iron skillets can double as baking dishes. This differs from many other cooking pots, which have varying components that may be damaged by the excessive temperatures of 400 °F (204 °C) or more. Cast iron is a very slow conductor of heat and forms hot spots if heated too quickly, or if heated over an undersized burner. However, it has excellent heat retention properties. If given time to equalize, the entire pan will eventually heat to an evenly high temperature, which includes any iron handles, making it important to use protection to prevent burns. Enameled cast iron is cast iron that has a vitreous enamel glaze applied to the surface. The fusion of the glaze with the cast iron prevents rusting, eliminates the need to season the metal, and allows more thorough cleaning. Enameled cast iron is excellent for slow cooking and drawing flavor from foods. Furthermore, pigments used in the enameling process can produce vibrant colors. While enamel-coated cast iron doesn't have the seasoning and cleaning issues of bare cast iron, a similar style of enamel-coated cast iron can cost three or four times its bare cast iron counterpart. For those seeking to reduce iron in their diet, enameled cast iron limits the leaching of dietary iron into food. However, some of the benefits of bare cast iron, such as the ability to withstand searing heat and resist sticking, are lost through enameling. In addition, chipping of the enamel coating can occur if the pan is dropped, overheated, or cold water is added to a hot pot. An American Dietetic Association study found that cast-iron cookware can leach significant amounts of dietary iron into food. The amounts of iron absorbed varied greatly depending on the food, its acidity, its water content, how long it was cooked, and how old the cookware is. The iron in spaghetti sauce increased 945 percent (from 0.61 mg/100g to 5.77 mg/100g), while other foods increased less dramatically; for example, the iron in cornbread increased 28 percent, from 0.67 to 0.86 mg/100g. Anemics, and those with iron deficiencies, may benefit from this effect, which was the basis for the development of the lucky iron fish, an iron ingot used during cooking to provide dietary iron to those with iron deficiency. People with hemochromatosis (iron overload, bronze disease) should avoid using cast-iron cookware because of the iron leaching effect into the food. A seasoned pan has a stick-resistant coating created by polymerized oils and fats. Seasoning is a process by which a layer of animal fat or vegetable oil is applied and cooked onto cast-iron or carbon steel cookware. New cookware should be vigorously washed in hot water with a strong detergent to remove any casting oils from the cookware's surface. A light coat of oil is applied and the cookware is placed upside down in an oven above a large pan (to drain for an hour), the pan can now be removed, then the oven set to 350 degrees Fahrenheit (180 degrees Celsius) and baked for 30 minutes. Some cookware comes pre-seasoned from the factory. A proper cast iron seasoning protects the cookware from rusting, provides a non-stick surface for cooking, and reduces food interaction with the iron of the pan. However, exposure to acidic foods such as tomatoes removes the seasoning, and the cookware must be re-seasoned again. Enamel-coated cast-iron pans do not need seasoning, as the enamel coating prevents rust in most instances. It is recommended to maintain the seasoning frequently to keep the food from sticking to the iron. Seasoned cast iron pans have a high emissivity coefficient. This means that they strongly radiate infrared radiation which helps indirectly cook the food as well as by heat conduction via the oil where the food touches. Because other cookware cleaning techniques like scouring or washing in a dishwasher can remove or damage the seasoning on a bare cast-iron pan, these pans should not be cleaned like most other cookware. Some chefs advocate never cleaning cast-iron pans at all; simply wiping them out after use, or washing them with hot water and a stiff brush. Others advocate washing with mild soap and water, and then re-applying a thin layer of fat or oil. A third approach is to scrub with coarse salt and a paper towel or clean rag. The primary producers of traditional cast iron in France are Le Creuset and Staub, though both companies only offer enameled cast iron cookware lines. Netherton Foundry in Shropshire, England, produces cast iron and spun iron cookware. Skeppshult is a Swedish foundry that produces cast iron cookware and cast iron kitchen accessories. While there are many well-established brands in the United States such as Milo, Camp Chef, Lodge, Bayou Classic, and John Wright, most manufacture their cookware in China. Additional manufacturers of enameled cast-iron cookware include Milo, Cousances, Ferleon, Tramontina, Le Chasseur, Lodge, Descoware, FINEX, Combekk and John Wright. Several newer brands are associated with well-known celebrities and chefs, including Daniel Boulud Kitchen, Martha Stewart, Rachael Ray Cookware (made by Anolon), and Mario Batali (made by Copco). ^ Ragsdale, John G. (2015). Dutch Ovens Chronicled: Their use in the United States. Fayetteville: The University of Arkansas Press. p. 1. ISBN 978-1-55728-690-1. ^ Ragsdale, John G. (2015). Dutch Ovens Chronicled: Their use in the United States. Fayetteville: The University of Arkansas Press. p. 3. ISBN 978-1-55728-690-1. ^ Carroll, Louise. "Skilled in skillets: Dentist's hobby forged in cast iron history". The Times. The Times. Retrieved May 9, 2018. ^ Park, Eleanore (April 12, 2018). "Eat Joyfully, and Other Wise Advice form Nigella Lawson". Wall Street Journal. Retrieved May 9, 2018. ^ "Heavy Metal: the Science of Cast Iron Cooking". Cooking Issues. February 16, 2010. Retrieved November 26, 2018. ^ "Use & Care: Enameled Cast Iron Use & Care". lodgemfg.com. Retrieved May 9, 2018. ^ Sherman, Elisabeth. "This Is Nigella Lawson's Favorite Cookware". Food and Wine. Food & Wine. Retrieved May 9, 2018. ^ "Techniques for Restoring an old Cast-Iron Skillet". November 7, 2015. Retrieved December 30, 2007. ^ Geerligs, PD; Brabin, BJ (August 2003). "Food prepared in iron cooking pots as an intervention for reducing iron deficiency anemia in developing countries: a systematic review". J Hum Nutr Diet. 16 (4): 275–81. doi:10.1046/j.1365-277x.2003.00447.x. PMID 12859709. ^ Patel, Kamal (June 8, 2016). "Are cast iron pans unsafe?". Examine.com. Retrieved November 26, 2018. ^ "Use and care for Lodge Seasoned Cast Iron". Archived from the original on May 12, 2013. Retrieved April 23, 2013. ^ "Using and Caring For Your Cast-Iron Skillet". August 8, 2015. Retrieved February 29, 2008. ^ "YouTube: Good Eats Episode 1 Pt.2 "Steak Your Claim"". ^ Good Food Team (December 5, 2017). "Yule be rapt: The Good Food team gift guide". Good Food Australia's Home of the Hats. Good Food. Retrieved May 9, 2018.